Hello! Today is a very different post than what I usually post. Even though I've always enjoyed fashion, I find that the older I get my interest in fashion is increasing. Partly because I have more money to spend on clothes than I've ever had before in my life, and also because I wear a uniform for my day job and tend to get very dirty, so I really need to 'dress up' whenever I have the chance to feel like a 'woman'. I subscribe to a lot of Fashion Blogs and I'm constantly 'pinning' fashion ideas on Pinterest, but I really notice a lack of fashion blogs dedicated to the 'older woman' and almost every picture on Pinterest is of a young, very thin woman. If you just looked at ads and pictures, you would think the rest of us are just walking around naked, or dead. So I decided it was time for me to make a change and start my own 'Fashion Blog' for women. Now, my blog is titled 'Amy's Creative Pursuits'. I realize most of my followers are interested in my paper crafting, but if you read the 'About Me' paragraph in my sidebar, I want this blog to be about so much more than just the art of paper-crafting. I want it to contain posts of anything of 'creative interest to me', which is why I've been posting a lot of travel posts and gardening posts lately. So today is my very first Fashion Post. It was a cool seventy degrees here in Northern Wisconsin so this is what I wore to church. Now, the maxi skirt/dress is all the rage in fashion right now and a lot of people think that no one over the age of forty should wear one. Really? Why not? I'm the one with spider veins and cellulite....if anyone should be wearing a maxi dress it should be me. Us 'older women' really like to cover and conceal those things! I added this denim jacket which I purchased at Express. This is another fashion 'don't' for older women. 'Don't wear anything that you've worn during another part of your lifetime'. In other words, because denim jackets were all the rage when I was in high school, and I remember having one just like this, I'm too old to wear one now. Hogwash! If it looks good on you....wear it! Now, I'm not endorsing older women dressing like a teeny bopper; I think everyone has seen an embarrassing example of that in public; but I don't think we need to look like were ready for the rocking chair either. Use some common sense and wear what looks good on your frame and not your age. Frankly, I think I've seen more fashion 'don'ts' from women wearing clothing that isn't right for their frame/size, rather than their 'age'. I believe people in general look and feel younger than the generation before them, and their fashion should reflect that. I really like the denim jacket for several reasons, for one, it keeps me warm inside heavily air conditioned buildings. I despise air conditioning. I never understand why after 'freezing' all winter people want to close up their doors and windows during the summer and 'freeze' inside. I can understand hotter climates having central air, but in Wisconsin it is hardly necessary except on the rare occasions it get over 90 degrees. The second reason I love the denim jacket is that it hides my flaws. Due to too much fun on vacation, I'm about 10 lbs heavier right now than I normally am. And of course all the extra weight is never equally distributed but lands right on my upper arms and stomach. The jean jacket hides all those extra pounds beautifully until I'm able to get them off again. If your wondering where I got this awesome dress, would you believe I only paid $1.99 for it on a clearance rack at Rue 21 over three years ago? Now, I never shop clearance racks...for one I don't have the patience for them, and two, in my opinion by the time something hits the clearance rack it's already out of style. But I was shopping with my daughter that day, and she spotted the dress and bought one too. 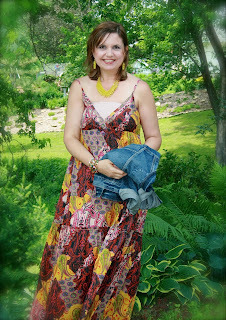 I bought it simply as a 'cool, summer' dress that I could wear on a hot day around the house. I never intended to wear it outside in public. But then, maxi dresses became one of the hottest fashion trends this year, and here I am! I do have to wear a camisole under it though, because it shows way too much cleavage for my taste. I don't have a picture of the shoes I wore with the dress. My husband, who was my photographer insisted he couldn't get them in the shot without backing too far away. I would have shown a closeup, but I didn't have a pedicure so I was too embarrassed. I basically wore one of the newer bejeweled sandals that looks kinda Bohemian. For my jewelry, I chose this darling necklace and earring which my daughter and I found at Charming Charlie on our Springfield, Missouri trip. I absolutely LOVE that store, and I wish I had one where I live. The closest one to me is about two hours from where I live, so I stop and visit one every chance I get. 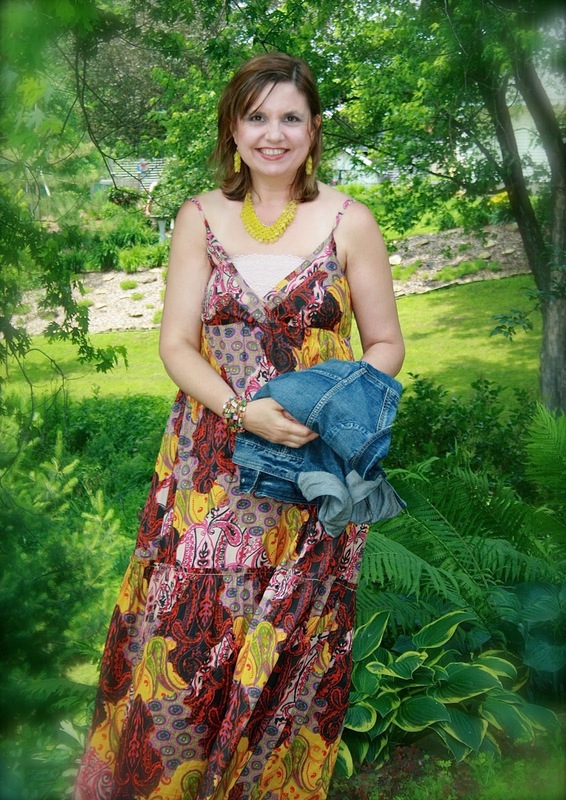 I hope you enjoyed my first 'Fashion for Women Over Fifty' post. I certainly enjoy talking about fashion, so I will definitely be posting more Fashion Posts. If you know of any fashion for older women ideas or blogs I'd be interested in, I'd love to hear about them. Oh wow ! Love this post !! Your dress is perfect, trendy dress, perfect with ballet flats or wedges shoes (hm poor english don't know if you're understand lol !!). And denim is timeless, it goes with everything !! I kive this idea and look forward to reading more! This is great!! I love your outfit!! I'm not quite 50 yet, but will enjoy reading these posts!! Oh this is wonderful Amy, I am so looking forward to reading about fashion for women over 50 and I so agree that it is more about wearing clothes that suit or flatter your frame than how old you are when you wear it. Within reason of course:o0. I am well over 50 and am looking forward to more post on the topic. Love this post Amy. You look fabulous, and I can't believe how inexpensive that dress was. It is gorgeous! I need to go shopping... Wish it wasn't so time consuming..
Just found this via Pinterest. Your outfit looks great! I'm not over 50, but I am over 40 and maxi dresses are pretty much all I wear during the summer. They are cool and comfortable during hot, humid Southern summers. And you don't have to have a perfect body for them to look good! I even wear mine to work on "casual Friday" instead of jeans and I always get compliments. Just because you're over 40 (or 50) doesn't mean you have to be frumpy or dress like grandma! Just found this via Pinterest. Your outfit looks great! 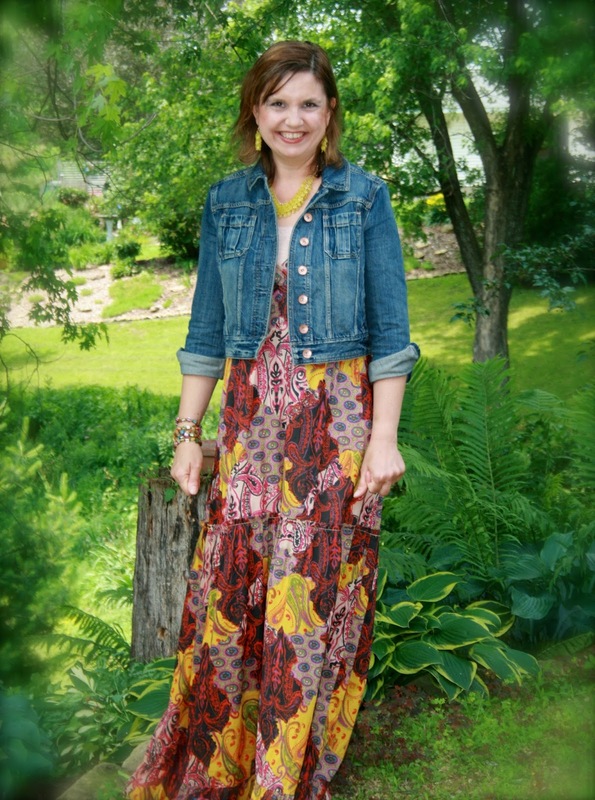 I'm not over 50 (45 this year), but maxi dresses/skirts are pretty much all I wear all summer. They are great for hot, humid Southern summers and flatter you even if you don't have a perfect body. I even wear them to work on "casual Friday" instead of jeans. Thanks for a great post! I love what you wrote. I turned 60 this year and I have always love fashion but now I am worry about dressing ridiculous for my age. I like Boho type of fashion among others. As I look here, I noticed that even though I search for 50+ & 60 year old women fashion, the models are all young with perfect bobies. This makes it hard for me to visualize myself with the outfit they are wearing because they are not old. It will nice if they post fashion with real 50. 60 years old women. Thanks Lily! It is so frustrating isn't it? Even stores or companies whose target audience is older women use younger models with perfect bodies. That is why I look to fashion blogs for my styling tips now. So I can see real women wearing clothes, not models. I think you look fantastic and I like the denim jacket addition too. The dress is perfect colour pairing with the changing of the leaves.